This is the first time a desktop (well, handheld, really) application I’ve contributed to has been released. 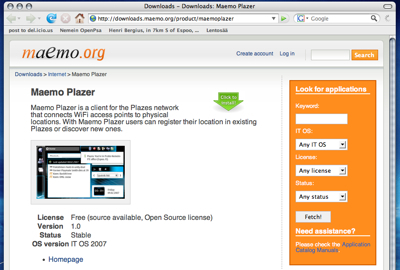 It is definitely a cool first step into the Maemo world. There are of course lots of development ideas we have for the application. 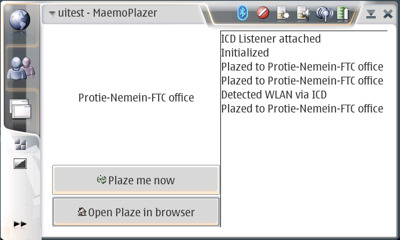 We’re considering if it could become a more generic WiFi utility by combining it with the GNOME WiFI autologin applet, and also planning to make it a GeoClue backend so that other geo-aware Maemo applications can use Plazes position information. If you have an N800 please install the app and try it out! Bugs can be reported to our Garage tracker. Please note that this does not run in the SDK since some required command-line utilities are missing from there. 08 February 2007. 1 minute read. 02 March 2007. 1 minute read.